Written by the creator of the Haunted Heartland Tours, this book is an excellent blend of history and hauntings. 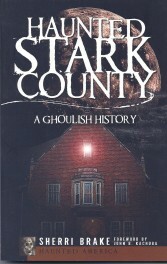 Beginning with a brief history of Stark County and its significance in Ohio’s past, the author tells stories of the Erie Canal, the Underground Railroad, cemeteries, the Influenza Epidemic of 1917-18, haunted restaurants, true crime. There is an intriguing chapter on “dowsing for graves”—the author says she has had success in locating unmarked graves by using a dowsing rod. Ghostly diners, violent crimes of passion, phantoms peering from theatre balconies, canal workers who still walk the tow-paths–the haunted history of Stark County includes characters and legends as bizarre as they are terrifying. Stroll along silent corridors of an abandoned asylum and linger among graves of Civil War dead- and discover the eerie ends of Stark County’s departed souls.